In 1975, Vandel developed the first large four equal wheel drive tractors designed for large agricultural operations in France, based on an innovative principle, using modular design, engineering, chassis manufacturing and assembling the best components, engines, gear boxes and axles. From 1978, these unparalleled machines in Europe, largely distributed in France, were exported to Africa and the Middle East to large sugar and grain farms, for cultivation and transport purposes. 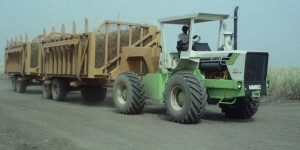 Specially designed for transporting, the tractor models designed by VANDEL allow all specific transport requirements for low-density products in large volumes to be met (waste, sugar cane, cotton…). With or without a crash bar, the VANDEL tractor cabins are suspended on rubber silent blocs, which guarantee complete separation from the transmission system. The equipment includes all the necessary driving control and comfort features. The VANDEL cultivation tractors were engineered for all agricultural, subsoiling, ploughing and pre-seeding soil preparation operations. 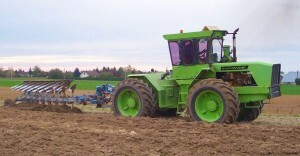 A combination of tools with subsoil cultivator at the front, rotary harrow and sowing machines at the rear allows for maximum use of the available power.